Dress up your patio or deck with this stylish Home Fashions International Outdoor Wicker Settee Cushion. This Better Homes and Gardens classic cushion provides the perfect setting for entertaining or relaxing at the end of your day. With the knife edging and matching ties to keep it in place, this settee cushion is a fabulous accent for your home decor. The Solution Dyed Acrylic fabric provides the ultimate fade resistance, retains its strength and resists damage from mold and mildew.&nbsp;Plus, it is easy to care for and can be wiped clean with a damp cloth. Dimensions: 43&quot;L x 18&quot;W x 4&quot;H; Care instructions: Spot clean with mild detergent. Rinse well and Air Dry. I love this settee cushion. It fits nicely. As you can see from the picture, it is tufted and it is very comfortable. The cost is reasonable. 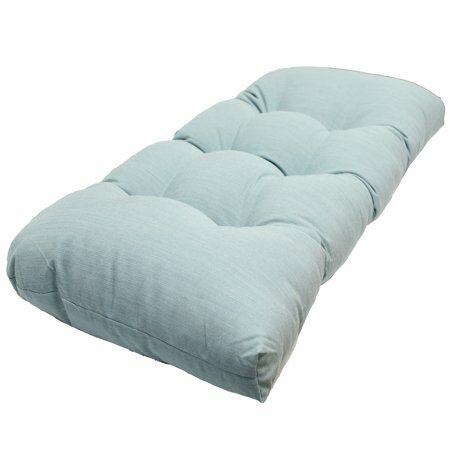 I also bought same type cushion for my rocking chair. Glad I purchased. Beautiful sea foam green color and comfortable!! I ended up buying a second one for a backrest!